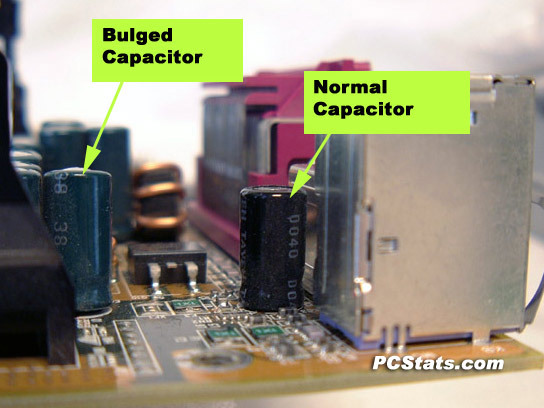 Blown, Burst and Leaking Motherboard Capacitors - A Serious Problem? Abstract: faulty capacitors are suspected to have been rooted in the theft of an aqueous electrolyte formula which was not copied correctly. Blown and Leaking Motherboard Capacitors - A Serious Problem? While it may be true that we go through a lot more motherboards at PCstats.com than an average consumer will in a lifetime, it's the boards that fail which seem to get noticed most - especially when they force a dreaded system reinstall. This particular Slot A motherboard was recently retired from active duty because the computer it was in became unstable, and too unreliable. This system had in fact been reinstalled a few times when no physical capacitor failure was visible, but this last time a quick inspection within the case had shown disastrous events underway. After ripping the computer apart to try an diagnose the strange problems which seemed to point to Windows 2000 instability issues, or possibly bad memory or hard Drive, we found half the low-ESR (Equivalent Series Resistance) aluminum capacitors on the board in pretty bad shape. Specifically, every single JPCON 6.3v 2200microfarad, and JPCON 6.3v1500 microfarad capacitor were either bulged out at the top about to pop, or had blown out the rubber stopper at the base and were leaking electrolyte (which had turned into a brown crusty stain on the PCB). The odd part was that every single JPCON 16v 470microfarad capacitor and all of the TAYEH brand capacitors were perfectly fine. At the time we chocked up the failure to a bad on-board power supply circuit and just assumed something, possibly a MOSFET, had partially failed and was overloading subsequent components. While I'm not an EE, that reasoning seemed to explain why half of the 48 capacitors were blowing themselves up like little aluminum balloons, and the rest weren't. Fast forward a few months and while reading through the Toronto Star newspaper it becomes clear that the odd failure we experienced might not be such an isolated occurence. 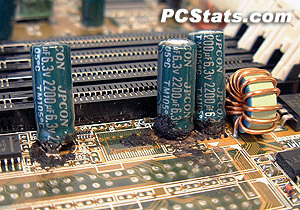 We discussed this issue in the PCstats.com Newsletter and while the motherboard pictured here is about 1-2 years old, it is the only one we have seen until recently where capacitor failure was actually visible. To paraphrase the opinions of the author of the Toronto Star article* , the faulty capacitors are suspected to have been rooted in the theft of an aqueous electrolyte formula which was not copied correctly. If you were to open up a capacitor you would find thin sheets of paper and metal rolled up together. The entire assembly is then wetted with an aqueous electrolyte solution. However, if the formula is not correctly mixed up, hydrogen gas can apparently build up in the aluminum can with time. The gas causes the hermetically sealed aluminum cans to burst, or partially blow out the rubber end cap. If electrolytic capacitors "dry out" they won't work properly, and that can cause problems with the computer which can be very difficult to figure out. Just when we'd more or less forgotten about the previous issues, we experienced capacitor problems firsthand again, this time in the form of a FIC AU11 motherboard which had been the base of a previously stable office machine. It died without warning, and upon removing the board we noticed that 8 of the larger capacitors, specifically four of the GSC 10 volt 2200microFarad capacitors and four of the smaller GSC 6.3v 1000mf capacitors had blown their tops and leaked electrolyte. In the same time period we began experiencing difficulties with an ABIT board, a KT7-RAID. while looking at the board we noticed one partially blown capacitor and several obviously bulging ones. Not a good sign. The affected parts were all four JPCON 10 Volt, 2200microFarad capacitors and one of the smaller JPCON 6.3V 2200microFarad caps. At the time, the whole faulty capacitor issue had more or less died down, but this got us to thinking again. What if the lifespan of the faulty capacitors was coming to an end. Was this going to be just one of a rash of similar incidents in 2004/2005? It's a complex problem, and the fact that businesses have even been set up to replace faulty mainboard capacitors is an interesting footnote to just how widespread this issue may be as older motherboards begin to show their age. If you know how to solder and read the labels on the aluminum capacitors, it should be possible to replace the capacitors yourself - assuming you can find identical replacements at a local electronics parts supply store. Aluminum capacitors are relatively large compared to other board mounted components, and in the factories are installed by hand. 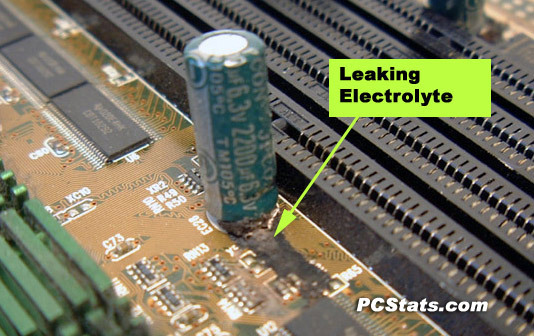 We'd like to know if you have ever had problems with a motherboard due to blown or leaking capacitors. We have set up a discussion in the PCstats forums, so if you have experienced this issue or know someone who has, let us know. Pictures would be good too. It seems that a class action lawsuit has just been launched against ABIT, one of the few Taiwanese Motherboard manufacturing companies to actually admit they had a problem with faulty capacitors at one point. This seems to mirror the class action suit that was brought against MSI in the summer of last year. We'll keep an eye on this story and let you know what happens. It does seem rather harsh that the only company that admitted they had a problem is getting sued though; this is not exactly going to encourage other computer companies to be honest about their products, is it?